Siena is a city that is located in Tuscany, Italy. 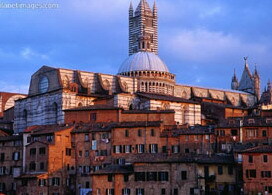 The historic center of Siena has been declared as a world heritage site by UNESCO. 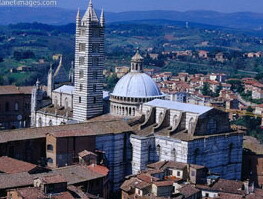 The main influences for this decision are the Duoma, Siena's Cathedral and the Piazza del Campo. The Piazza del Campo is regarded as one of the most beautiful and breathtaking civic spaces in Europe. The Piazza del Campo is the center square of Siena. It is a formation of the conjunction of the three hills on which the city was formed. The site was built in the 13th century and is considered to be one the greatest medieval squares in Europe. It is in this square that the famous Palio is held bi-annually. After undergoing Feudal rule and Episcopal rule, the area broke up into a number of small autonomous regions in 1115. In 1167 the commune of Siena was declared independent and by 1179 there was a written constitution available for its governance. Much like Venice, Siena is a place of mystery and romance. The mystery associated with Siena stems from medieval times: during the battle of Montaperti, it is believed that a white cloud descended and provided cover to the Seines, aiding them to crush the enemy. The Duomo di Milano or more commonly known as the Duomo is a famous gothic cathedral. The striking white marble is a sight to see. The main feature of the cathedral is the Madonnina's spire which is placed at a height of 108.5 meters and was designed by Francesco. The construction of the cathedral began well back in 1386 and was completed in1965 by which time renovation work was also taking place along with the construction work. There is an international event that is held annually which is called the Palio. This is an event held on the second of July and the Sixteenth of August every year and is facing more controversies in recent years with the ill treatment meted out to the horses and injuries that the riders suffer from. The horse race is conducted throughout the city over a set track and has become a major tourist attraction for tourists from all over the world. The race is conducted between the different contradas of Siena; these are made up of the neighborhoods of the city of Siena. In the ancient times there were seventeen contradas, each depicted by a design of the contrada. 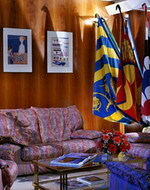 This is the color and the arms of the contrada. Although there are seventeen contradas, only ten horses are allowed to participate in the race. In this year ten contradas participate, the following race sees the other seven contradas taking part by default. Three other horses are selected randomly. The first horse race in the region began with the Grand Duke Tuscany setting bull fighting as an out lawful activity. The first Palio took place in the year 1650 and was held only on the 2nd of July. This day was chosen as it was the day of the feast of the Visitation. This day was also marked as the day of a local festival in the honor of Madonna of Provenzano. Best Western Executive Hotel offers comfortable accommodation and convenient facilities to make your stay a pleasant one. A modern, comfortable hotel located in a quiet residential area between the railway station and a major conference centre. The hotel is also close to the historic town centre. Guests can take advantage of frequent buses to area attractions and terminals. The hotel has comfortable and well furnished rooms that are equipped with modern amenities. You can dine at the onsite restaurant that serves local cuisine. 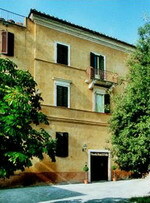 historic Hotel Garden is located in Siena, Italy, within one kilometre of the city centre. It is six kilometres from the famous Medici Fortress market and 16th-century Fortezza Medicea. 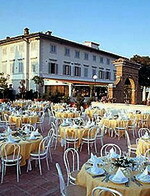 Hotel Garden is a traditional three-storey Tuscan Villa set in elegant gardens with a large terrace. Inside, much of the hotel retains its traditional style with marble floors and elaborate painted ceilings. Multilingual concierge staff at the 24- hour front desk can provide sightseeing advice and information. The Hotel Garden offers guests a complimentary American buffet breakfast. Dressed in light, neutral colours, with white table cloths and wooden floors, La Limonaia restaurant serves a selection of Tuscan and international dishes. Drinks can be enjoyed under the vines on the large terrace. Hotel Garden has an outdoor pool with sunbeds and a tennis court. Nearby there are opportunities for jogging, hiking, biking and fishing. 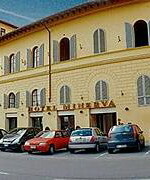 The Hotel Minerva is a four-floor hotel located in the historic centre of Siena commanding views over the whole town. Some rooms have balconies but all benefit from picturesque views across the buildings and rooftops of Siena. Guests can unwind with a drink in the bar, or make use of 24-hour room service for in-room refreshment. The lounge room has a reading area and can be used as a conference venue suitable for up to 40 people; modern audio-visual equipment is available and there is a complimentary high- speed Internet connection. Garage parking (surcharge) is also provided. Tourist visitors will enjoy taking in the sights of Siena which can be comfortably accomplished on foot; Piazza del Campo, the main square featuring the Fountain of Joy, is just 500 metres away and a perfect place to soak up the ambience and watch the world go by. The historic Piccolo Hotel Il Palio, in the centre of Siena, was converted from a monastery in the 15th century and features arched, wooden ceilings in its reception. It has 26 guestrooms, over three floors, with simple decor, dark wood furnishings and coordinating patterned fabrics. Room amenities include satellite television, minibars, refrigerators, direct-dial phones and desks. Bathrooms have hair dryers. Guests can start their day with a buffet breakfast, and ask staff at the front desk for advice on local attractions and help organising activities and excursions, such as a Chianti tour. The hotel also has laundry facilities and an elevator. Parking is available nearby. The hotel is well placed for exploring the surrounding area; the 16th-century Fortezza Medicea, with is park, open-air theatre and wine museum, is just 500 metres away, while the Piazza del Campo and Duomo are both one kilometre distance. The Sangallo Park Hotel stands atop a hill overlooking Siena, Italy, and the wine-growing terrain of Chianti just two kilometers below. 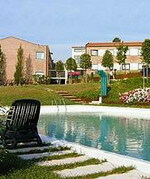 Monteriggioni and Crete Senesi are within 10 kilometers of this hotel. Buffet breakfasts are complimentary each morning at the hotel and the lobby bar serves light fare and cocktails throughout the day and into the late nights. Surrounded by olive groves and gardens, the Sangallo Park Hotel boasts panoramic views of the Tuscan countryside, especially from the seasonal outdoor pool area and gazebo. High-speed wired and wireless Internet access is available throughout the hotel's public areas. The Chianti wine region just two kilometers from the Sangallo Park Hotel offers visits to the historical Tuscan vineyards and wine tasting tours with some of the most select Italian wines available today.